Number two is "try before you buy." The trick here is to look for wines that are sold by both the glass and the bottle. The restaurant will have bottles of these wines already open, so you can taste a few possibilities before making your final selection. In our case, we narrowed our selection to two contenders. One was an Australian Shiraz and the other was an Italian Sangiovese. Both were reasonably priced and the varietals in theory would pair well with both our meals. Our server brought us a glass with a splash of each one and we picked the one we both liked best - the Italian. 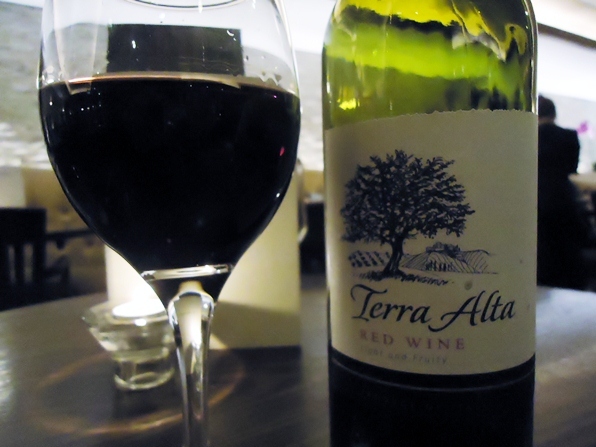 The wine turned out to be a Terra Alta Red Wine. We took a picture of label thinking we could easily research the winery online at a later time, but our search has been fruitless. Does anyone recognize this wine? Posted on September 5, 2012 by Jeff & Sally Toister and filed under Tasting Experiences and tagged Red Blends.